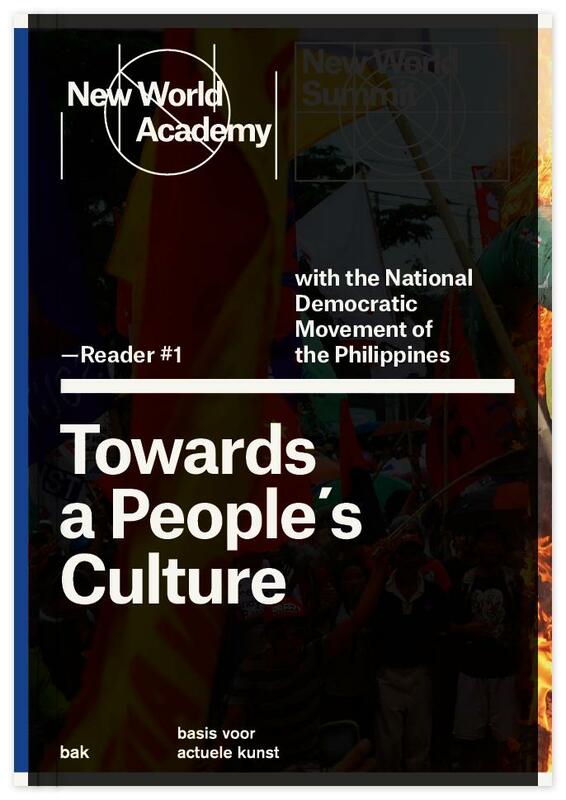 The National Democratic Movement of the Philippines consists of a variety of underground and guerrilla movements as well as (semi-)legal political parties and organizations with strong leftist and Maoist affinities. Its development can be traced back to resistance movements against the Spanish and United States occupations in the Philippines. Today, the movements continue their struggle against US influence in the Filipino government. Central to the movements’ understanding of art is the figure of the cultural worker, whose task is to both educate, and be educated by, the masses of landless peasants and the urban poor. With contributions by: Ericson Acosta (activist and poet, Manila), Beatrice de Graaf (Centre for Terrorism and Counterterrorism, The Hague), Alice G. Guillermo (theorist, Quezon City), Lisa Ito (theorist, Quezon City), Jose Maria Sison (poet and founder of the Communist Party of the Philippines and the New People’s Army, Utrecht), and Mao Tse-tung (revolutionary, theorist, and former Chairman of the Communist Party). For inquiries or to order a copy of this publication, please send an e-mail to [email protected] Click here to view the reader online.